Tuesday, April 12, 2011 will mark the fiftieth anniversary of the first human spaceflight by the Russian Cosmonaut Yuri Gagarin aboard Vostok 1. His one-orbit flight marked the beginning of the “Space Race.” Three weeks after Gagarin’s first flight, U.S. Astronaut Alan Shepard made a suborbital flight aboard Freedom 7, and less than a year after Gagarin’s historic flight, U.S. Astronaut John Glenn orbited the Earth three times aboard Friendship 7. The United States is, to date, the only nation to land astronauts on the Moon and return them safely to earth. This unparalleled achievement, inspired by President John F. Kennedy’s challenge to send men to the moon and return them safely to earth, was reached on June 20, 1969, when Neil Armstrong and Buzz Aldrin, Jr., on Apollo 11, became the first, of twelve, humans to land on the moon and return to earth. Our current presence in space is marked by the multinational International Space Station where astronauts from around the world are conducting the research needed to advance space exploration beyond Earth’s orbit. Humans are not built to survive in the atmosphere-less, microgravity, high radiation, environment of space and yet there we are. The physiological challenges that must be overcome to maintain a continued presence of humans in space, whether aboard the Space Station or on long-duration flights to distant planets, are not negligible and require the consideration of a wide array of biological, physiological, psychological and neurological effects. In this Space Frontiers Lecture I will focus on the adverse impact on health and well-being incurred by space flight crews on long missions, and the countermeasures that are being developed to mitigate these effects in order to ensure that those who venture into space return in essentially the same or better condition. Dr. Alford is a Distinguished Service Professor at Baylor College of Medicine. He served as the Executive Vice President and Dean of Medicine from 1988-2004, and as Chancellor from 2004 to 2010. He is Professor of Otolaryngology–Head and Neck Surgery and held the Olga Keith Wiess Chair in Otorhinolaryngology from 1981 to 2010 when he stepped down as department chairman. In 1985, he was appointed a Distinguished Service Professor at Baylor. From 1993 to 1994, he served as the Interim Chairman of the Department of Surgery at Baylor and Chief of the Surgery Service at The Methodist Hospital. He served as Chairman of the Department of Otorhinolaryngology – Head and Neck Surgery from 1967 to 2010. In January 1996, the Baylor Board of Trustees named the Department in his honor. A specialist in Otolaryngology–Head and Neck Surgery, Dr. Alford serves on the staff of several hospitals in the Houston area: The Methodist Hospital (TMH), Ben Taub General Hospital (BTGH), St. Luke’s Episcopal Hospital (SLEH), Texas Children’s Hospital (TCH), the Michael E. DeBakey Veterans Affairs Medical Center (VAMC), and The Institute for Rehabilitation and Research (TIRR). He is Chief of Service at TMH, BTGH and VAMC. He has authored more than 140 scientific papers. In 1991, he received the Good Housekeeping Award as one of the “Top 400 Best Doctors in America,” and in 1999 he received the Association of Operating Room Nurses of Greater Houston Distinguished Surgeon Award. He has served on the Advisory Board of the Johns Hopkins University School of Medicine. Dr. Alford has also served as a member of the National Advisory Council of the National Institute for Neurological and Communicative Disorders and Stroke, the National Advisory Council of The National Institute for Deafness and Other Communication Disorders, and the Advisory Council of the Lunar and Planetary Institute. In addition, he has served on the NASA Headquarters National Advisory Council. Other NASA participation has included the select White House “Blue Ribbon” Advisory Committee for the Redesign of the Space Station, The Aerospace Medicine Advisory Committee (Chairman), The Life and Microgravity Sciences and Applications Committee (Chairman), and the Life Sciences Advisory Committee. In addition, he has served on the NASA Space and Earth Sciences Advisory Committee and The Task Force on the Scientific Uses of the Space Station. Dr. Alford held the Friedkin Chair for Sensory System Integration and Space Medicine from 2000-2011. Dr. Alford has served as Consultant to the Surgeon Generals of the United States Army and the United States Navy. He served as Chief Editor of the Archives of Otolaryngology publication for ten years. Dr. Alford is a member of the Board of Directors of the Alkek Foundation. He also serves as Medical Advisor for the John S. Dunn Research Foundation and the Diana Helis Henry Medical Research Foundation. Dr. Alford received the M.D. with honor from Baylor University College of Medicine in 1956. As a medical student he was elected to Alpha Omega Alpha Honor Medical Society. 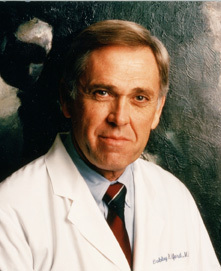 After completion of a residency in Otolaryngology–Head and Neck Surgery, he served as a Fellow in Otology at the University of Texas Medical Branch and as a Special NIH Fellow at the Johns Hopkins University School of Medicine, and became certified by the American Board of Otolaryngology in 1962. In 1962, he came to Baylor College of Medicine as an Assistant Professor. He was promoted to Professor in 1966, and in 1967 was named chairman of the Department of Otolaryngology–Head and Neck Surgery at Baylor College of Medicine. Dr. Alford was instrumental in developing the concept of the unique Neurosensory Center of The Methodist Hospital and Baylor College of Medicine and more specifically the Institute for Head and Neck Surgery of that Center. Dr. Alford is a Fellow and former President of the American Academy of Otolaryngology–Head & Neck Surgery, a former President and Executive Vice President of the American Board of Otolaryngology, a Fellow and former member of the Board of Governors of the American College of Surgeons, and a former President of the American Council of Otolaryngology–Head & Neck Surgery. He has received The Outstanding Alumnus Award from Baylor College of Medicine. Dr. Alford is a member of The Johns Hopkins Society of Scholars and a member of the Institute of Medicine of the National Academy of Sciences. He was awarded the NASA Distinguished Public Service Medal in 1995, and was the recipient of the American Institute of Aeronautics and Astronautics Jeffries Aerospace Medicine and Life Sciences Research Award for 2003. In 2010, he received the newly established NSBRI Pioneer Award in recognition of his efforts and accomplishments in blazing new trails on behalf of the Institute, its partnership with NASA, and the space biomedical community at large. Dr. Alford is the Chairman of the Board and the CEO of the NASA-funded National Space Biomedical Research Institute (NSBRI). As CEO, he leads a Consortium of institutions that includes Baylor College of Medicine as the lead institution, and Massachusetts Institute of Technology, Harvard Medical School, Johns Hopkins University, Morehouse School of Medicine, Rice University, Texas A&M University, Brookhaven National Laboratory, Mount Sinai School of Medicine, University of Arkansas for Medical Sciences, University of Pennsylvania Health System, and University of Washington. Dr. Alford has authored more than 140 scientific papers.